WRENTHAM, Mass. – In the opening game of Thursday night’s Div. 1 Central-East semifinal, King Philip jumped all over visiting Quincy to build a 12-4 lead and then extending it back to seven points at 20-13. It looked like the Warriors were going to have a quick one-game lead on the Presidents in the rematch of last year’s five-setter at this same stage. Instead, Quincy rallied to win 12 of the next 15 points and steal the game. 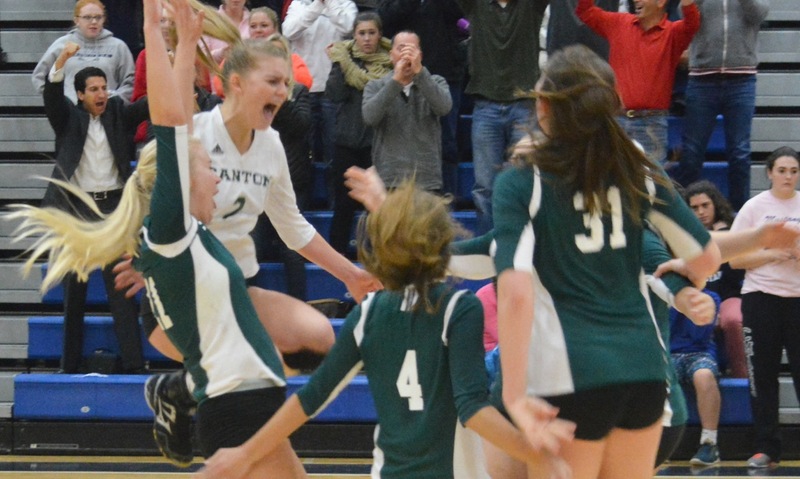 Volleyball is a game of momentum swings and KP watched the Presidents carry their momentum over into a dominant second game that put Quincy on the verge of another sectional final. That could have been it for another strong season for the Warriors, but instead KP fought back. Urged on by its home fans, KP swung the momentum back on its side and stormed back into the match, winning game three and saving a pair of match points to take game four. Unfortunately for KP (19-3), Quincy was not rattled by the Warriors forcing a fifth game or by the Warriors jumping out to an early 4-1 lead in the deciding set. The teams battled back and forth and in the end, Quincy (19-3) had just enough to pull out the 3-2 (25-23, 25-16, 15-25, 26-28, 15-13) victory and advance again to the final. “They played great,” said KP coach Kristen Geuss about Thursday’s opponent. “They are a great defensive team; they picked up everything. Unlike on Tuesday, KP had the size advantage on Quincy, but the Presidents still had strength on the outside, especially senior Jessie Lei. Quincy took an early 4-1 lead but KP bounced right back with an 11-0 run to take control of the first set. Carly Adams had three straight aces at one point in the run and Sydney Phillips, who was chosen as the Hockomock League MVP by the coaches, added four kills. The Presidents cut into the lead to get it down to four points, but again KP had an answer with Michaela Palumbo getting a big block to push the lead back to seven at 20-13. Things fell apart for the Warriors in the serve-receive game and Quincy stormed back into it. Geuss tried calling both her timeouts but the visitors took the set. “We came out a little slow, as usual, and in tournament games you just can’t do that,” Geuss explained. The energy of the first game carried into the second and Quincy built an early lead. After an error cut the lead to just two points, the Presidents went on a 9-3 run and took command at 19-11. The lone Warriors player who was having any success in the second was outside hitter Liv Baldufu>, as Quincy abandoned the block and sat back to seemingly dig every hit. The Warriors found their game in the third. Phillips had been quiet since her strong start but suddenly started clicking off the passing of Adams and the defensive play of libero Amanda Loewen. Phillips had seven kills in the second and Loewen closed out the game with back-to-back aces to keep the match alive. KP jumped out to a big lead in the fourth set as well with Loewen getting two more aces and the Warriors saving a point with Adams, Loewen, Kat Kmetz, and Molly Croke all keeping the ball alive before Balduf finished it with a blast down the line to make it 14-6. The fifth set seemed inevitable at that point but again the Presidents showed resiliency to bounce back, cutting the lead to just three at 18-15. Phillips had the response for KP with three straight kills to give the home team a 23-17 lead, but the Warriors could not close it out and a kill by Shannon Foley tied it at 24-24. Twice KP had to save a match point and then Emma Lopez rose up and earned her fourth kill of the game to seal a 28-26 win. In the fifth, with the crowd riveted to every hit, KP took a 4-1 lead after a pair of Phillips kills. Quincy bounced back to win the next five points and force Geuss into a timeout. Lopez tied it at 8-8 with a kill but Quincy would regain the lead at 12-9 and force a second timeout. A service error and a Phillips kill got KP within one. After an errant shot, Phillips made it 13-12. A service error set up the third match point for Quincy, but Phillips kept the game alive with another kill. The fourth match point turned out to be the difference for Quincy and fittingly it was Lei that got the winner. “We weren’t picking up the tips. One or two points here or there could’ve changed the momentum easily,” said Geuss. WRENTHAM, Mass. – One true test of character is the ability to bounce back from adversity and learn from your mistakes. 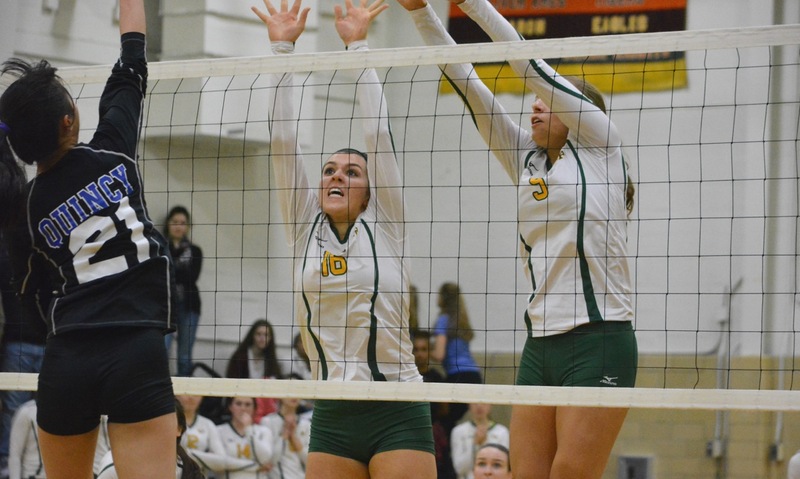 Down one set to none, the King Philip Warriors were able to face adversity, in the form of the Oliver Ames Tigers, and bounce back winning the next three sets to grab a 3-1 victory. Oliver Ames came out of the gates strong with a lot of energy and the team’s battled back and forth, with none getting too far ahead of the other. It came down to the wire, but strong serving from OA boosted the Tigers just enough to grab a 26-24 win. “I think we started out slow. We weren’t playing 100% in game one, sometimes we tend to do that,” King Phillip head coach Kristen Geuss said. The teams traded aces, kills and blocks in the second set. When it seemed like one team was about to pull away, their opposition would fight right back and even the score. The Warriors began to inch away towards the middle of the second set, only to lose a four point lead. With the score knotted at 19 apiece, KP scored six straight to win the set and even the match 1-1. The third set is when the Warriors came alive, starting the set on a 14-1 run, due in large part to great serving from Sydney Phillips. The Warriors closed the set with a score of 25-7. The final set was a little more tightly contested, but some big serves from KP’s Amanda Loewen and Angela Vellante helped the Warriors finish off the Tigers with a final set score of 25-15. The final point of the game came to a very fitting end in the form of a booming spike from Phillips. Phillips finished with 28 service points and totaled up 10 aces on the day; while up front, she added nine kills. Carly Adams added 22 service points and four aces, Loewen had 13 service points and nine digs and Jess Stoffel had a big day at the net with four kills and a pair of timely blocks. Oliver Ames’ Alyssa Gavin and Maya Fetcho highlighted the group of very strong Tiger servers, who tested KP with a strong serves. “That was probably the strongest serving team we have faced so far,” Geuss said of OA. King Philip (5-0) will be back in action on Friday, when they take on the Taunton Tigers. Oliver Ames (2-4) is back in action on Friday against Attleboro. Foxboro, 5 @ Taunton, 0 – Final – Foxboro junior Anthony Barreira netted four goals, senior Devante Teixeira scored once and had two assists and sophomore Joe Morrison notched an assist. 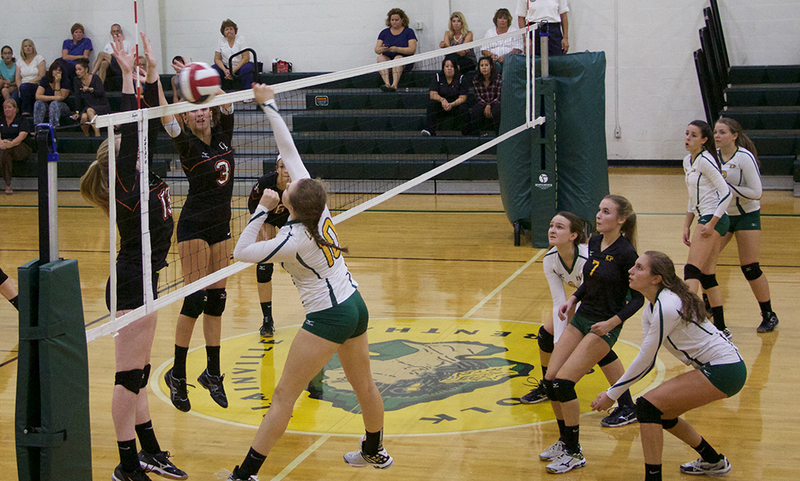 Taunton, 3 @ Coyle & Cassidy, 0 – Final – Taunton took care of their crosstown rival 25-7, 25-10, 25-15. The Tigers had 19 total team aces and 23 team kills. Tatum Speicher had 19 assists while Emily Moor had eight kills and Alyssa Gibson and Sam Reaume each had five kills each. 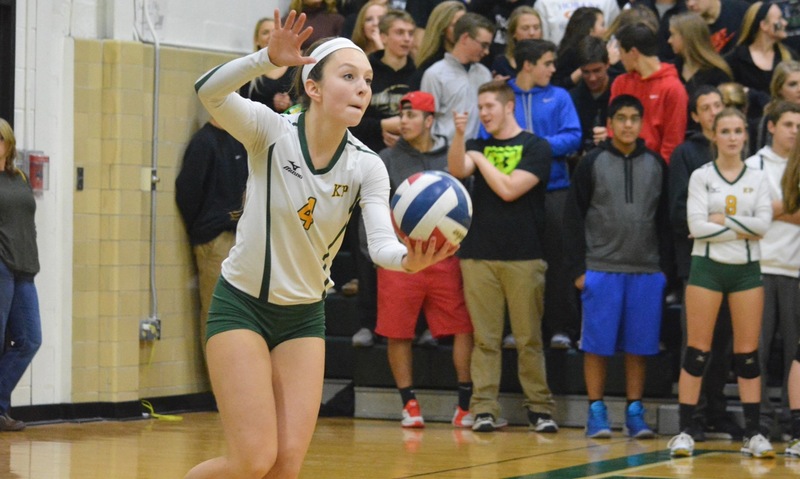 King Philip, 3 @ Walpole, 1 – Final – The Warriors dropped the first game (18-25) but rallied to win the next three 25-17, 25-12, 25-20. Gwen Uyrus had 11 kills and three aces, Liv Balduf added three kills and three aces and head coach Kristen Geuss said Josie Rowean had a strong game at the net and serving. Oliver Ames, 145 @ Milford, 163 – Final – Oliver Ames got four strong performances, led by Steven Tasho and Brian Lambert, who each carded a 36. Brady Allbritton and Jack Green each shot a 37 for the Tigers. Milford’s Ryan Tomaso carded a match low 34 for the Scarlet Hawks. King Philip, 159 @ Franklin, 171 – Final– King Philip’s Sebastian Ladoulis played the last seven holes at two under par to finish with a match low 36 while Mickey Riley carded a 39. Franklin freshman Matt D’Errico, senior Matt Dao and sophomore Bryan Woelfel each shot a 42.